The Roberts Court has produced interesting decisions, including that corporations are “persons” and money is speech. Take for instance the “persons” argument. Logic would tell you that being a “person” has something to do with being a human being. Not so fast. U.S. law has conferred “personhood” on, besides corporations: governmental bodies, such as cities and counties; foreign governments suing in U.S. courts; any party having a claim against an estate; and, amazingly, certain slaves! The twist here is that, (though they were normally considered a form of “livestock” in pre-Civil War southern states) slaves attained “personhood” under the law if the slave was “capable of committing a riot in association with white men” (this last definition an interesting form of negative emancipation). (Bouvier’s Law Dictionary, 1856). Sadly, slaves other than those mentioned, though “freed” in stages through 1867, were not accorded full “personhood citizenship” until it was given their descendants by the 1964 Civil Rights Act. The artificial “persons” mentioned above may have some advantages over human persons, such as immortality. For example, corporations, originally formed for specific short-term projects such as financing a cargo of slaves or sugar, never seem to die — changing their names (Phillip Morris to Altria, for example); ownership, as their stock is bought and sold; as well as their nationalities, as assets, production and markets render national boundaries invisible. Justice Roberts specifically stated at one point that speech designed to incite terrorism was only a problem if it was coordinated with a “foreign” terrorist organization (FTO). His statement would appear to suggest that speech designed to incite terrorism, if emanating from purely domestic sources, is protected by the First Amendment. As this is written, news of the latest in a long chain of murderous outrages by Klan members surfaces in a peaceful community near Kansas City. “Speech” at the point of a gun. How many armed “sleeper cells” and neurotic individuals are there around the U.S. poised to act in a similar way — triggered by the “incitement” previously mentioned? Getting back to the money/ speech nexus, TomPerkins, an outspoken advocate for the “rights” of the super-rich, suggested that a person should have as many votes as he pays dollars in taxes. I suppose that Mr. Perkins’ reasoning is that the poor who pay little or no taxes should have no right to vote or a say in public affairs. The irony is that Perkins’ argument only works when you have a progressive tax system— which the rich and their advocates in Congress are aggressively trying to get rid of. His other problem is that, in my experience, the richest in every country use every trick in the book to avoid paying taxes anyway — eliminating the advantage he seeks. The avalanche of oligarch money in coming elections, freed by the Roberts Court in the Mc-Cutcheon decision, would appear to make ordinary voter participation irrelevant — not to mention other restrictions on voter access proposed by primitive thinkers at various levels of government. Without voters, who will select our future leaders — those with the most guns or the most money? Will it matter? Dan Townsend is a traveler, working and learning in various states and countries, presently enjoying the variety of cultures in the borderland. Occupational areas have included MerchantMarine; photographic technology; defense and air traffic control (communications). Presently involved in real-time energy management technologies and occasional contributions to the local dialogue on important issues. 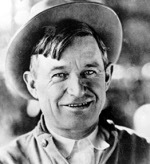 The Wisdom of Will Rogers, or was it his humor before a (well!) paying audience? Loan sharks and interest hounds—I have addressed every form of organized graft in the United States, excepting Congress, so it’s naturally a pleasure for me to appear before the biggest. You are without a doubt the most disgustingly rich audience I ever talked to, with the possible exception of the bootleggers’ union, Local No. 1, combined with the enforcement officers. Now, I understand that you hold this convention every year to announce what the annual gyp will be. I have often wondered where the depositors hold their convention. I had an account in the bank once, and the banker, he asked me to withdraw it. He said I had used up more red ink than the account was worth. I see where your convention was opened by a prayer, you had to send outside your ranks to get somebody that knew how to pray. You should have had one creditor there; he’d have shown you how to pray. I noticed in the prayer the clergyman announced to the Almighty that the bankers were here. Well, it wasn’t exactly an announcement. It was more in the nature of a warning. He didn’t tell the devil, as he figured he knew where you all were all the time anyhow. I see by your speeches that you’re very optimistic of the business conditions of the coming year. Boy, I don’t blame you. If I had your dough, I’d be optimistic too. Will you please tell me what you all do with the vice presidents the bank has? I guess that’s to get anybody more discouraged before they can see the main guy. Why, the United States is the biggest business institution in the world. They got only one vice president. Nobody’s ever found anything for him to do. You have a wonderful organization. I understand you have 10,000 here, and what you have in federal prisons brings your membership up to around 30,000. So goodbye, paupers. You’re the finest bunch of shylocks that ever foreclosed a mortgage on a widow’s home. Enemies of universal health care derisively refer to the ver­sion being implemented by the Obama Administration as “Obamacare,” as though any­thing including the name Obama is beneath contempt and unworthy of their sup­port. History of this issue in the United States is a chronicle of missed opportunities, result­ing in, at present, the least effi­cient and most expensive (dou­ble the cost, by most estimates) health care system in the devel­oped world. For those interested in facts on the subject, it is worth not­ing that Native Americans had no concept of “fee for service” regarding health care in their communities, though it was the custom to “gift” the medicine man for a successful outcome. Puritan communities in the Massachusetts colonies worked tirelessly to promote sanitation, quarantine those with com­municable diseases and em­ploy remedies, whether brought from Europe or borrowed from the natives, to the limit of medi­cal knowledge of the time. There is evidence that the Dutch colony of New Amster­dam built the first hospital in North America. Clearly the communities mentioned consid­ered health to be an essential community concern. The British Navy financed shore facilities for fleet health care with an assessment on the wages of sailors and offi­cers starting in 1624. The as­signment of doctors to all fleets started soon afterward, result­ing in, among other things, mandatory administration of lime juice to combat scurvy, which was a major factor in Britain’s rise to the pinnacle of naval power. The U.S. copied the British example and added the require­ment that merchant ships en­tering U.S. ports be assessed for the health care of merchant seaman, resulting in a network of seaman’s hospitals, later to become part of the U.S. Public Health Service. Civilian populations in the U.S. experienced repeated deadly outbreaks of diseases due to poor sanitation through the 18th and 19th centuries. The influx of immigrants to fill the ranks of industrial labor re­quired strenuous efforts to co­ordinate public health efforts and provide public water sup­plies, sewage and waste collec­tion services in our cities. Finally, in 1917, a joint effort, formed of the American Asso­ciation of Labor and the Ameri­can Medical Association House of Delegates, promoted a sin­gle- payer health system for the U.S., using the model of that of Germany put together by Chan­cellor Bismarck in 1883. The plan, otherwise likely to be im­plemented, had, however an un­expected problem. A major part of the insur­ance market at that time were “burial insurance” policies, meant to insure that the sub­scriber would be spared the in­dignity of what was known as a “pauper’s burial” — usu­ally unmarked in desolate “pot­ters fields,” otherwise populated by deceased prisoners, the “in­sane” and the indigent or un­identified homeless. The 1917 plan provided for a “death benefit,” there being no Social Security at the time, which the insurance industry considered a threat to its prof­its from the sale of burial pol­icies. World War I provided an excellent excuse to sabotage the whole project by depicting it as a “Prussian menace” at a time when people were so incensed about German military atroci­ties in Belgium, the use of poi­son gas and submarine attacks on civilian shipping, that Dashc­hund dogs were kicked to death on the streets of America. Of course, the chaos and ter­ror felt by massive fatalities re­sulting from the flu epidemic of 1918 was a lesson in the con­sequences of not having coor­dinated health care in the U.S.. But by that time, the Univer­sal Health Care plan of 1917 had been scuttled. Future efforts toward uni­versal health care were painted with the label of “socialism” as universal health care became a platform in the agenda of the Bolshevik regime in Russia and the socialist Weimar Republic which succeeded the wreckage of Kaiser’s Germany. Captain Harry S. Truman, whose Missouri volunteers faced German troops benefit­ing from 30-plus years of Chan­cellor Bismarck’s Universal Health Plan in World War I, as President offered the “Truman Health Plan” in an address be­fore Congress in November, 1945. His reasons were compelling. So poor was the health of young men reporting for military ser­vice in both World Wars I and II, one-third were rejected. He was also concerned with the sit­uation of veterans of World War II and their families who were losing VA health benefits imme­diately upon separation from the service as our services were demobilized. President Truman’s plan en­visioned a single system allow­ing veterans and civilians to seamlessly access their health care needs, with a large enough customer base to absorb pre-ex­isting conditions and the dis­tinction between “service con­nected” and more mundane health challenges without pen­alties and delays. Ironically, many enemies of Universal Health Care are pro­posing providing veterans with resources to enable access to ci­vilian health care service in the face of VA system deficiencies. President Truman’s ghost must be enjoying this.